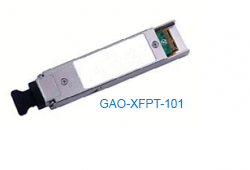 GAOTek’s XFP tunable transceiver provides a high-speed serial link at signalling rates ranging from 9.95 Gb/s to 11.35 Gb/s for sale to the United States, Canada and Globally. Tunable transceivers have the capability to adjust wavelength. GAOTek’s XFP tunable transceiver complies with the 10 Gigabit Small Form-Factor Pluggable (XFP) multisource agreement (MSA) (INF-8077i) and Tunable XFP for ITU frequency grid applications (SFF-8477). The transmitter recovers, retimes and passes the 10 Gbps serial data stream to a modulator driver. The driver modulates a C-band-tunable integrated laser Mach-Zehnder (ILMZ). On the receiver side, an APD receiver recovers the 10 Gbps data stream from an APD/ trans-impedance amplifier, and passes it to an output driver. Our XFP tunable transceiver complies with the ITU-T G.698.1 standard for Fiber Channel and Ethernet applications. This transceiver covers distances of up to 80 km. It provides digital diagnostic functions over a 2-wire serial interface for real-time access to parameters such as transceiver temperature, laser bias current, transmitted optical power, and received optical power and transceiver supply voltage. It has a sophisticated alarm systems to alert users if operating parameters fall above or below the factory-set range.